2013 ( AR ) · Spanish · Animation, Family, Adventure · PG-13 · 106 minutes of full movie HD video (uncut). 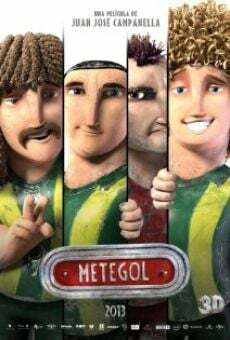 You can watch Metegol, full movie on FULLTV - Amadeo is a shy but virtuoso who will face the most formidable opponent on a football field: the Crack. In their grief, the main figure have the invaluable help of foosball players led by Wing, his charismatic far right. Amadeo and players will embark on a great adventure, with football as a backdrop and with love, respect, friendship and passion, is the first piece of 3D animation cinematográgica Argentina, with a budget of 9 million dollars, and is written by Juan Jose Campanella, director of " The secret in Their Eyes ". You are able to watch Metegol online, download or rent it as well on video-on-demand services (Netflix Movie List, HBO Now Stream, Amazon Prime), pay-TV or movie theaters with original audio in Spanish. This film has been premiered in theaters in 2013 (Movies 2013). The official release in theaters may differ from the year of production. Film directed by Juan José Campanella. Produced by David Burgess, Iván Kozicki, Juan José Campanella, Gustavo Ferrada, Victor Glynn, Gastón Gorali, Ricardo Freixa, Axel Kuschevatzky, Phin Glynn, Harriet Hammond, Mercedes Gamero and Javier Beltramino. Screenplay written by Gastón Gorali, Roberto Fontanarrosa, Michael Broadbridge, David Burgess, Eduardo Sacheri and Juan José Campanella. Soundtrack composed by Emilio Kauderer. Commercially distributed this film: 369 Productions, Universal Pictures International (UPI), Edko Films, Vertigo Films, NOS Audiovisuais, Splendid Film, Weinstein Company, The, United International Pictures (UIP), DirecTV Latin America (DTVLA), Vue Movie Distribution, Film Factory Entertainment, King Power, Axinite Digicinema and Gkids. Film produced and / or financed by 369 Productions, Televisión Federal (Telefe), 100 Bares, JEMPSA, Prana Animation Studios, Catmandu Branded Entertainment, Plural - Jempsa, Ministerio de Cultura, Antena 3 Films, Instituto Nacional de Cine and Artes Audiovisuales (INCAA), Instituto de la Cin. As usual, the director filmed the scenes of this film in HD video (High Definition or 4K) with Dolby Digital audio. Without commercial breaks, the full movie Metegol has a duration of 106 minutes. Possibly, its official trailer stream is on the Internet. You can watch this full movie free with Spanish or English subtitles on movie TV channels, renting the DVD or with VoD services (Video On Demand player, Hulu) and PPV (Pay Per View, Movie List on Netflix, Amazon Video). Full Movies / Online Movies / Metegol - To enjoy online movies you need a TV with Internet or LED / LCD TVs with DVD or BluRay Player. The full movies are not available for free streaming.